I went out to paint a different georgic scene, some hay rolls I spotted the night before, but they had already been picked up before I arrived. 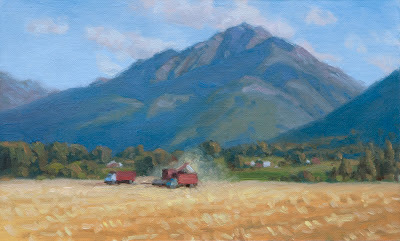 A short distance farther along the road, they were harvesting wheat and the bright red trucks and harvester surrounded by the glowing chaff cloud, the golden field, and the blue mountains, were too tempting to pass up. I usually avoid painting Chief Joseph Mountain because it is such a difficult shape to compose around, and because of its imposing size, and the fact that it seems to have a personality of its own, but today I couldn't resist. Looking at it from the western end, it doesn't look like such a big lump rising straight out of the flat valley floor. The truck drivers were very patient and friendly as they drove by. Study 10x6", Oil on Linen.